Gov. Dannel P. Malloy mixed two volatile issues Tuesday night on MSNBC as he defended accepting Syrian refugees in Connecticut, saying the security threat posed by refugees pales in comparison to the danger of domestic gun violence. 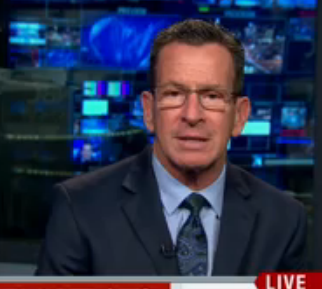 “And yet, those same governors who came out today and said we shouldn’t take refugees are the same governors who oppose common sense gun control laws in America,” Malloy said, repeating a line he used in Hartford. Malloy, one of 34 governors to participate in nearly a 90-minute conference call with senior White House officials earlier Tuesday, said that the federal government is closely reviewing refugees seeking to relocate to the U.S. Since 2011, the United Nations has recommended 23,043 Syrians for resettlement in the U.S., but only 7,000 were deemed acceptable for further review and, ultimately, only 2,000 were allowed to enter the country, Malloy said. “We’re talking about a tiny fraction of people,” Malloy said. Malloy, a Democrat in the first year of his second term, predicted the public and political establishment will take a more reasoned view, but the anti-immigrant governors will carry the day for a time. “They’re going to win the political argument for a while. People are going to think, ‘Hey, that’s great. Let’s be tough on people,’” he said.